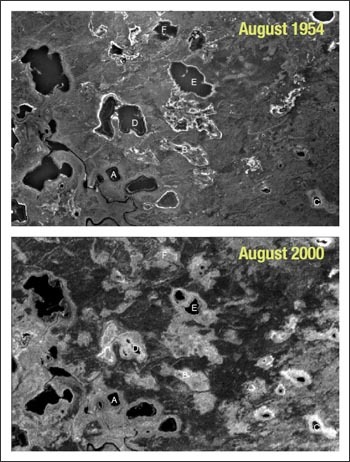 Diminished lake sizes on Alaska’s Yukon Flats are evident between 1954 (top: aerial photograph) and the 2000 (bottom: Landsat ETM+ image). Image credit: Institute of Arctic Biology, University of Alaska Fairbanks. Oct 13, 2006 • A first-of-its kind analysis of fifty years of remotely sensed imagery from the 1950s to 2002 shows a dramatic reduction in the size and number of more than 10,000 ponds in Alaska. The analysis, by University of Alaska Fairbanks scientists and published this week in the Journal of Geophysical Research, indicates that these landscape-level changes in arctic ponds are associated with recent climate warming in Alaska and may have profound effects on climate and wildlife. “Alaska is important in terms of waterfowl production and if you have a lowering of the water table that could have a potentially huge impact on waterfowl production,” said Dave Verbyla, co-author and professor in the School of Natural Resources and Agricultural Sciences at UAF. “This is an issue relevant to flyway management in terms of all the waterfowl that might use the Yukon Flats National Wildlife Refuge and overwinter elsewhere, and this is something that goes beyond the refuges in Alaska,” said A. David McGuire, co-author and professor of ecology at the Institute of Arctic Biology at UAF. National Wildlife Refuges cover more than 77 million acres in Alaska and make up 81% of the national refuge system. These refuges provide breeding habitat for millions of waterfowl and shorebirds that overwinter in more southerly regions of North America. Using black and white aerial photographs from the 1950s, color infrared aerial photographs from 1978-1982, and digital images from the Landsat satellite from 1999-2002, Riordan outlined each pond by hand. “With automated classification your accuracy goes down,” Riordan said. Cloud shadows can look like water and Alaska rarely experiences a cloudless day, said Verbyla.